At C405 Crossrail Paddington Station we are surrounded by sensitive receptors and listed buildings. Therefore, Costain Skanska Joint Venture (CSJV) are constantly working to improve our performance in terms of noise minimisation. In order to comply with our Section 61 agreement and to keep disturbance to a minimum, we split our site up into 2 different zones depending on their proximity to sensitive receptors. Zone A is further from residents and businesses and is therefore the less sensitive area. Zone B is close to the local receptors and is the sensitive area. Each zone has specific working hours and consented activities. 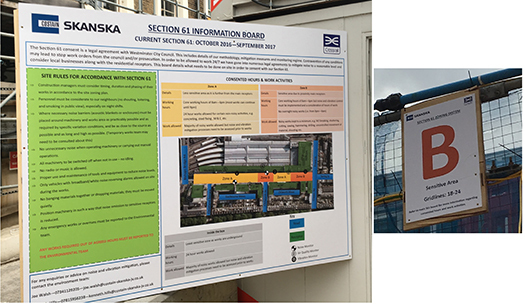 To portray the details of these zones and outline noise-specific site rules, CSJV placed 3 large Section 61 information boards in key areas around site, e.g. outside the permit office which is the only way onto site. CSJV also put up several ‘Zone A’ and ‘Zone B’ signs all along the site in order to make it immediately obvious which areas are considered ‘sensitive’.